Glasgow and Scotland centre Graeme Morrison was the captain of prestigious Dollar Academy's first XV as a schoolboy before finding success at professional level with Glasgow. Morrison made his international debut in 2004 and played in all four Tests against the Wallabies that year. He notched his first international try against Japan later that year. 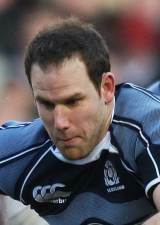 After a lengthy time away from the international scene, Morrison was recalled to the Scotland side for the Calcutta Cup game with England at Murrayfield in 2008 following some excellent form for Glasgow. Morrison became an increasingly important figure in the Scottish set up with his direct and powerful running a key weapon for Andy Robinson's side. He was among the pick of Scotland players during the 2010 Six Nations. However after a successful 2010 he missed the 2011 Six Nation through injury but was still included in Robinson's plans for the forthcoming World Cup in New Zealand.